You believe you are a rational, logical being who sees the world as it really is, but journalist David McRaney is here to tell you that you're as deluded as the rest of us. But that's OK- delusions keep us sane. 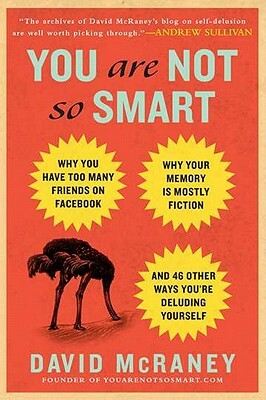 "You Are Not So Smart" is a celebration of self-delusion. It's like a psychology class, with all the boring parts taken out, and with no homework. Based on the popular blog of the same name, "You Are Not So Smart" collects more than 46 of the lies we tell ourselves everyday, including: Dunbar's Number - Humans evolved to live in bands of roughly 150 individuals, the brain cannot handle more than that number. If you have more than 150 Facebook friends, they are surely not all real friends. Hindsight bias - When we learn something new, we reassure ourselves that we knew it all along. Confirmation bias - Our brains resist new ideas, instead paying attention only to findings that reinforce our preconceived notions. Brand loyalty - We reach for the same brand not because we trust its quality but because we want to reassure ourselves that we made a smart choice the last time we bought it. Packed with interesting sidebars and quick guides on cognition and common fallacies, "You Are Not So Smart" is a fascinating synthesis of cutting-edge psychology research to turn our minds inside out. "You Are Not So Smart is the go-to blog for understanding why we all do silly things." "You'd think from the title that it might be curmudgeonly; in fact, You Are Not So Smart is quite big-hearted."